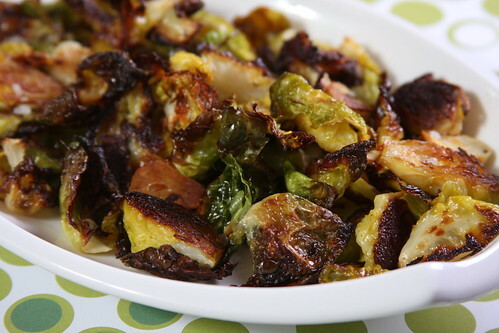 Brussels sprouts, when roasted, emit a wonderful aroma that’s similar to fresh-popped popcorn. This tiny belgian cultivar‘s leaves are both chewy and caramelized, smoky and crispy when roasted to perfection in a 400-degree oven. I usually just roast halved brussel sprouts but, for this dish, carefully removed the leaves with tongs as they were roasting to give every inch of them a good sear. Line a baking sheet with aluminum foil and lightly grease with some olive oil. Place the brussel sprout halves face down on the aluminum foil, topping each sprout with a little more olive oil. Place in the oven for 12 minutes. Remove from the oven and, using tongs, gently lift off the multiple layer of leaves from the sprouts, and place around the baking sheet, ensuring that the leaves do not overlap each other too much. Add the garlic to the baking sheet and return it to the oven. Check on the leaves and garlic every 3-5 minutes, removing any leaves that begin to slightly caramelize, placing those onto a plate or small bowl near your stovetop. Repeat this process until all of the leaves and garlic are slightly caramelized. Top with the coarse sea salt. Delicious side dish. I do love brussel sprouts. mmm these are one of my favorite side dishes to make! delicious!! Those brussels sprouts look amazing!! Great images! Welcome to food buzz, if you need any help navigating don't hesitate to ask!